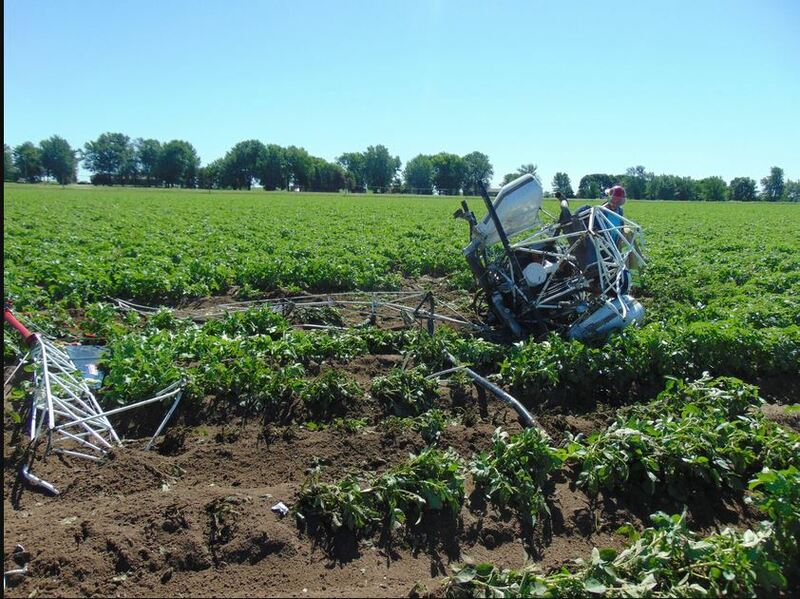 On June 15, 2017, about 1000 central daylight time, a Bell 47G helicopter, N90529, experienced a loss of engine power near Hastings, Minnesota. The commercial pilot was seriously injured and the helicopter was substantially damaged. The helicopter was registered to Northland Helicopters, Inc. and operated by Scott's Helicopters, La Sueur, Minnesota under the provisions of 14 Code of Federal Regulations Part 137 as an aerial application flight. Visual meteorological conditions prevailed for the flight and which operated without a flight plan. According to information obtained by the responding Federal Aviation Administration (FAA) inspector, after completing an aerial application, the helicopter was in cruise flight for the destination. Initially, the accident was reported as a loss of engine power; however, later the pilot reported shutting down the engine after impacting in a field. The pilot stated that the helicopter impacted the ground in a nose low attitude with a right roll tendency. The wreckage was examined on scene by the FAA inspectors and they did not find any anomalies with the helicopter. Fractured control rods were retained and examined, and no preimpact anomalies were detected. Operator: Scott's Helicopter Service Inc.
On June 15, 2017, about 1000 central daylight time, a Bell 47G helicopter, N90529, experienced a hard landing near Hastings, Minnesota. The pilot was seriously injured and the helicopter was substantially damaged. The helicopter was registered to NorthLand Helicopters Inc and operated by Scott's Helicopters, La Sueur, Minnesota under the provisions of 14 Code of Federal Regulations Part 137 as an aerial application flight. Visual meteorological conditions prevailed for the flight and which operated without a flight plan. According to preliminary information obtained by the responding Federal Aviation Administration inspector, after completing an aerial application, the helicopter entered in cruise flight for the return flight. The helicopter then experienced a loss of engine power. The helicopter descended and impacted terrain.